Here I am signing copies of my book Speaking the Piano this morning in Blackwell’s Edinburgh bookstore. Blackwell’s is my favourite bookshop in Edinburgh. 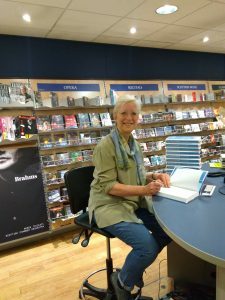 I’m usually there as a customer browsing the latest novels, buying a greetings card or having a coffee, so it was a delightfully through-the-looking-glass kind of experience to be sitting in the art books section signing copies of my own book. Blackwell’s has a bookstall at the Usher Hall and in the Queen’s Hall during the Edinburgh International Festival in August, and they plan to have copies of my book on display in both concert halls. While I was signing, we had an interesting chat about signatures. Mine is simple and legible: I’m one of those pedantic types who can’t stand to think that people won’t be able to read what I’ve written. Even when it comes to signatures I’ve never felt motivated to develop the blithe sort of flourish one sees tennis stars executing on souvenir programmes and oversized tennis balls as they leave the court after Wimbledon matches. But lots of people like an artistic signature. One of the staff showed me some CDs signed by performers whose signatures seemed divorced from their name and more resembled little works of abstract art. We looked at them this way and that. Were they meant to look like a musical stave, a harpsichord, a vortex? If I could bear to have an artistic signature, what would it be? A treble clef instead of an S, perhaps? This entry was posted on Friday 13th July 2018 at 1:58pm	and is filed under Books. You can leave a response, or trackback from your own site.